Exide Technologies has announced a sponsorship deal with Team Estrella Galicia 0,0 Marc VDS in this season’s MotoGP, the premier event in motorcycle road racing. Each event in the calendar attracts millions of viewers from around the world, making it an attractive marketing proposition for a global brand like Exide. Team Estrella Galicia 0,0 Marc VDS’s line up this season includes 23-year-old Franco Morbidelli, winner of last year’s Moto2 championship. The 2018 MotoGP season kicked off on March 18 with the Qatar Grand Prix. Morbidelli finished 12th, just 16 seconds behind the race winner, in an exceptional debut performance. This season he is racing alongside teammate Thomas Luthi, the 31-year-old who recorded 10 podium finishes in last season’s Moto2 championship. As part of the sponsorship deal, the Exide logo will appear on Morbidelli’s bike, team livery and in team promotional materials. “We’re delighted to be sponsored by Exide. 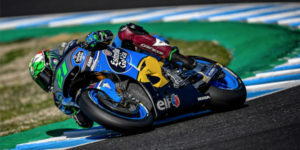 The company has some of the most advanced products in the industry, including the high-performing Exide Li-Ion motorcycle battery,” said Michael Bartholemy, team principal at Team Estrella Galicia 0,0 Marc VDS. Exide Li-Ion is up to 80 percent lighter than a standard bike battery, resulting in faster acceleration, more responsive braking and improved handling, according to Exide. The battery is maintenance-free and offers fast recharging and first-class safety features, the company adds. Plus, its low self-discharge rate makes it ideal for seasonal use, Exide says. Exide Li-Ion is part of the Exide Motorbike & Sport range.